"The hardest thing about writing my piece in the newsletter is remembering what happened this year," said Dylan, as we talked about our annual tradition of putting words and pictures together to chronicle the year that is about to pass and send out to friends and family. Many families have permutations of this tradition; we've received several in the mail already. The most common form is a letter written on festive stationery in the third person touching on various highlights of the year and what everyone in the family has been up to. My sister Corinne does something a little bit different, offering up an interesting recipes and book suggestions. As a pretend graphic designer with access to lots of pictures, I decided to incorporate words and images into an annual 4-page Holiday Hello about 10 years ago. The tradition has stuck, and we have colourful visual storybooks (of sorts) that remind us of moments and memories that we might have otherwise forgotten. I'm behind schedule this year; that is beyond debate. The first page is ready, but we'll need another day or two to complete the rest. My weekends, post A Christmas Carol, have been spent catching up on paintings that people wanted to have by the 25th. I was feeling a bit feverish toward the end of the day yesterday, so I decided to nest for the evening in hopes of keeping the bug at bay. It gave me a few precious hours to begin putting the Holiday Hello together whilst sipping hot ginger tea. Putting it together is easy, as I just use the previous year's as a template. New words, pictures and colours, and it's good to go. Like Dylan, I have a difficult time remembering all the different things that have happened: where we went on holiday, who we saw and what we did throughout the year. Pictures help a lot. On the Mac, the photos are stored chronologically, which makes things so much easier. 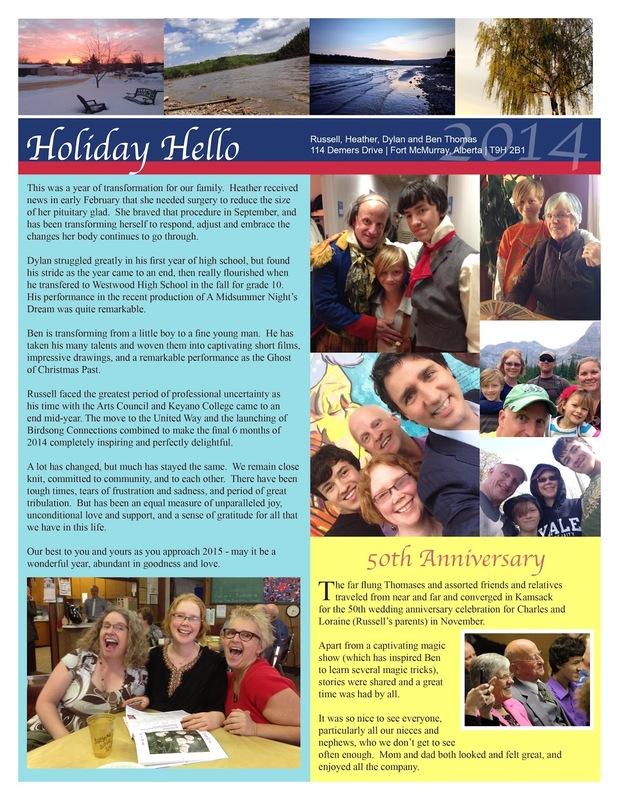 Heather and I have always collaborated on the writing of the newsletter, but in more recent years, both boys participate, contributing their personal synopsis of the year and thoughts about the year ahead. If anything, the activity allows each of us time to reflect, consider and appreciate. We include fun images of people, events, creations, sunsets and various other optical triggers that will give readers and viewers a sense of our lives in this beautiful northern place. For us, it becomes a treasured keepsake, a marker that will be cherished and referenced years into the future.